Click on a tab below to access resources by categories. Resources developed for new employees or board members may be used in the classroom, for continuing or self-education, or by people who are curious about the mission of Holy Names ministries. What is the SNJM charism? Brochure. Explains charism, the distinct spirit that animates each Holy Names ministry and which the ministries hold in common. Read online or download. 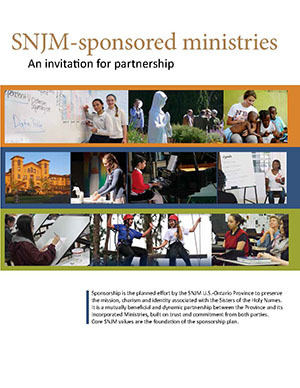 SNJM-sponsored ministries: invitation for partnership 8-page booklet that explains the mutual responsibilities of a Holy Names ministry’s executive leader, trustees/directors and the Sisters of the Holy Names. Read online or download and print on 11×17 paper and fold.